March 6, 2009, 9:56 a.m.
By Martin Langeveld @MartinLangeveld March 6, 2009, 9:56 a.m. The “individuated” stories selected by each reader are sent to a special printer being developed for MediaNews that each customer would have at home. The printer will format the stories and print them or send them to a computer or mobile phone for viewing later in the day. Ads will be delivered as well. Where possible, the ads will be matched to each reader’s choice of stories. For example, a reader who selects high school sports stories might receive ads from retail sports stores, or skiers might receive ski-related ads. Our greatest expense is printing and delivering a newspaper,” [MediaNews executive V.P. for sales and marketing Mark] Winkler said. “Eliminating it four days a week would be significant. Fax editions were tried again in the 1980s as a way to deliver news to offices as fax machines proliferated; these trials included some customized editions. The advent of the Web spiked that system, we thought for good. Why on earth would MediaNews want to try this all over again? Sure, there are some fresh bells and whistles in this version: the home printer could send the stories to a computer or mobile phone, according to Winkler. But wait, I can already get stories on my computer or mobile phone. And with an RSS feed or other tools, I can customize those stories to my interests. 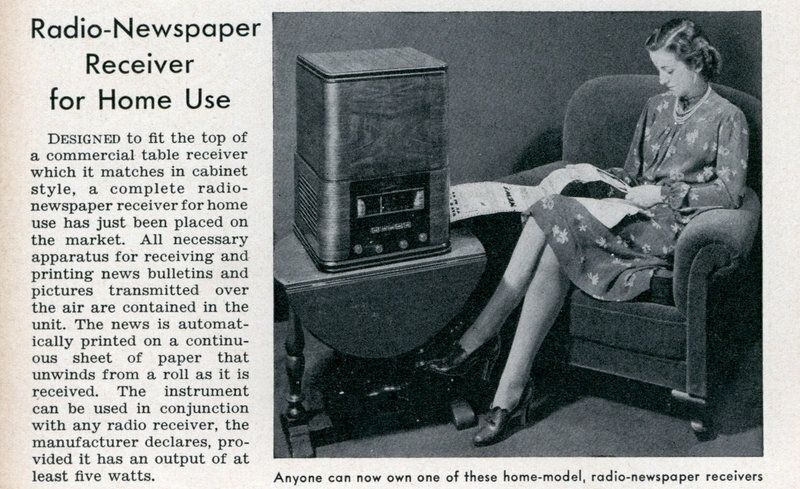 Why do I need a MediaNews-supplied device in my house as intermediary? The goal of reducing print frequency won’t be accomplished by shifting printing expense to consumers. The price of reams of paper and printing cartridges will likely outstrip the consumer’s cost of a home delivered paper on newsprint. The system adds inconvenience at the consumer end in the form of printer management. It can already be done with FeedJournal, free, without a dedicated piece of equipment. Why would readers want to pay for a narrower service that requires another appliance in their house? This method eliminates or minimizes serendipity, which is one of the things print still does better than digital delivery; it’s something consumers like, for both news and advertising content. If MediaNews truly is interested in cutting print down to a few days a week, that’s a laudable idea. As Winkler commented: “About 65 or 70 percent of a newspaper’s revenues come from ad sales on Thursday, Saturday and Sunday, so we’ll keep printing on those days.” And as I’ve been saying for months, most of the rest of the revenue would probably shift into those days if the rest were eliminated. It doesn’t take a new gadget to make possible the inevitable move to cutting print to two or three days a week (or even to once a week) and being digital all the time; it’s already the right thing to do. Let’s just get it over with. But by the way, if I have to start printing my own newspaper at home, I want a nice walnut-veneer printer cabinet like that lady in the picture has. POSTED March 6, 2009, 9:56 a.m.
Langeveld, Martin. "Back to the future: MediaNews revives “print your own newspaper”." Nieman Journalism Lab. Nieman Foundation for Journalism at Harvard, 6 Mar. 2009. Web. 19 Apr. 2019. Langeveld, Martin. "Back to the future: MediaNews revives “print your own newspaper”." Nieman Journalism Lab. Last modified March 6, 2009. Accessed April 19, 2019. https://www.niemanlab.org/2009/03/back-to-the-future-medianews-revives-print-your-own-newspaper/.